FengMing Electronic Science & Tech. Co.,Ltd. 2).Withstand high temperature,rust resistant,flame resistant plastic container,enveloped with flame resistant epoxy resin. 3).Withstand high voltage and resist outer electric interference ability. 4).Adoptting fortified metallized electrode,improve product's ability of withstand high voltage and big current. 5).For connection terminal,adoptting tinned copper wire which standard dia. isΦ0.8和Φ1.0,can debase signal's dissipation. 6).Non induction structure,low electrical induction,high insulation resistance,long using life,steady emperature characteristic. 7).Adoptted excellent Polypropylene film as dielectric,advanced manufacture craft and automatic production equipment,can ensure products' high quality standard,our products have the following features: excellent stability,good self-healing performance,low dissipation factor in high frequency,excellent frequency characteristic,high precision capacitance,can withstand big current,high insulation resistance,long using life,can withstand 1.8KV pulse voltage,etc. 8).Flame resistant performance up to UL94/V-0 grade. Withstand high temperature,rust resistant,flame resistant plastic container,enveloped with flame resistant epoxy resin. 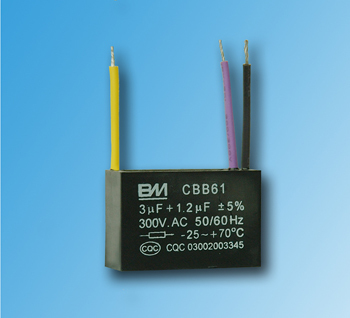 Withstand high voltage and resist outer electric interference ability. Adoptting fortified metallized electrode,improve product's ability of withstand high voltage and big current. Non induction structure,low electrical induction,high insulation resistance,long using life,steady emperature characteristic.